Special Features: Liner Notes (PDF), Clean Opening and Closing. Last edited by WTK; 04-11-15 at 02:05 AM. While supplies last, customers who order this item will also receive an exclusive 1.5" goldtone coin featuring Sailor Moon's second transformation brooch and transformation phrase! This premium coin is exclusive to RightStuf.com customers only! Please note that all customers will receive the coin while supplies last (when we run out, the coin won't be shown here on the listing.) Your order status when you log in to the site will show the coin included on your order. Sailor Moon R: Season 2, Part 1 is now up @ Amazon. MSRP for Reg is $69.99. 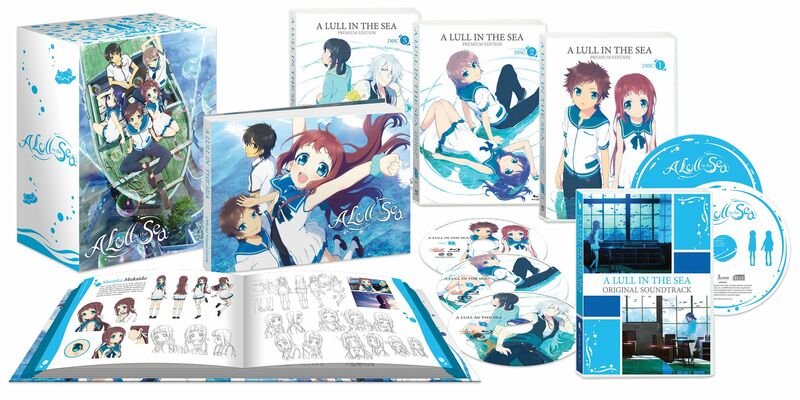 via TRSI: Customers who pre-order this item by May 31st will also receive an autographed illustration by Asato Mizu, the author of the original manga! Contains episodes 9-12, plus an original soundtrack CD, a 24-page deluxe booklet "Umanohone Magazine 5 & 6", two collectible wall pin-up pictures illustrated by Asato Mizu (author of the original manga), and a double-sided poster illustrated by SIN-EI ANIMATION. Spoken Languages: Japanese, English subtitles, Spanish subtitles. The wait is over, sci-fi anime fans— the new sci-fi action thriller anime 009 Re:Cyborg will be up for pre-order later today— and getting an English dub! Plus, we’re announcing the release specs AND the cast announcement! What’s 009 Re:Cyborg? Well, if you loved the classic cerebral sci-fi action anime like Ghost in the Shell or Akira from “the good old days”— movies that astounded you visually, throttled your adrenaline, but also made you think— 009 Re:Cyborg is definitely an extension of that tradition. The film comes to you with the cutting-edge action-packed production values of legendary studio Production I.G. (Psycho-Pass, Ghost in the Shell: Arise), plus smart, slick direction that could only come from the mind of the director of Ghost in the Shell: SAC and Eden of the East, Kenji Kamiyama. The first-run release of 009 Re:Cyborg is our Limited Edition and comes with an exclusive 44-page Interview and Data booklet, packed to the brim with behind-the-scenes key points about the direction and world of the film, as well as artwork, character profiles, and a very thorough interview with the director. As anime fans, we’ve loved seeing Director Kamiyama’s take on how technology affects human interactions in our modern and increasingly globalized world, themes hugely apparent in his past works, so if you like cool sci-fi that also has meaning, 009 Re:Cyborg is a real showcase of all of that. When we say that this booklet is packed, we mean PACKED— it’s very dense and a great value add to any fans who wants to get a little more out of anime. Look out for previews of the booklet soon! With that all out of the way, here’s your cast! 009 Re:Cyborg will be availabe for pre-order later today and releases on Blu-ray Combo Pack July 28. Stay tuned for more details, including sneak peeks at the packaging and booklet, plus the trailer! Featuring an EXCLUSIVE Yato business card holder (and a bonus 5-yen coin to get you started as a god) - limited to 500 units, so pre-order now! Last edited by WTK; 04-18-15 at 06:52 AM. Minor delay for FREE! : Season 1 Collection. April 28 to May 4 (Monday). HOUSTON, April 21, 2015 – Home video distributor Section23 Films today announced its August slate of releases; including Sentai Filmworks’ legendary classic VAMPIRE HUNTER D! Remastered in high-definition from the original elements and with a new English dub. Last edited by WTK; 04-26-15 at 11:58 AM. Contains episodes 1-13 of season 4 plus a story guide leaflet. Special Features: Clean Opening and Ending, Japanese Commercials. Last edited by WTK; 04-26-15 at 11:53 AM. Contains episodes 1-12 plus a full color 64-page hardcover art book with character info, interviews with cast members, episode guides, and full color illustrations. Special Features: Haruka Exploring Kotoura Town, Haruka's Room, Clean Openings and Endings, Japanese Trailers. Jojo's is NOT a Viz release. Confirmed. - Total Run Time: approx. 109 min. Customers who order by 06/30/15 will receive a collection of ten sheets of key frame drawing reproductions showing Itsuki Inubozaki transforming into a Hero! - Combo Box Set including Blu-ray, DVD and Special Soundtrack outtakes CD ! - Total Run Time: approx. 100 min. At this time, we haven't received a Blu-ray solicitation for JoJo's, so we can't confirm one way or the other if it'll get a BD release. Customers who pre-order this item by June 30th will also receive one random super-deformed Battle Lovers character card illustrated by the chief animation director, Yumiko Hara! Contains episodes 1-4, plus a special opening theme song CD, a deluxe booklet containing illustrations, lyrics, and a Let's Sing! in Japanese, and a photo card. Special Features: 6 Animation Shorts, Clean Opening and Closing, TV Commercial Collection. Customers who pre-order this item by June 30th will also receive a collection of ten sheets of key frame drawing reproductions showing Itsuki Inubozaki transforming into a Hero! Contains episodes 9-12, plus a special soundtrack outtakes CD, a 24-page deluxe booklet, and two collectible wall pin-up pictures illustrated by Takahiro Sakai. Special Features: Promotional Video, TV Commercial Collection. Contains episodes 1-12 and an OVA. Special Features: Image Vocals, Clean Opening and Closings, Promotional Clip, Commercials.